The church will reopen its doors to the public again on Sunday. 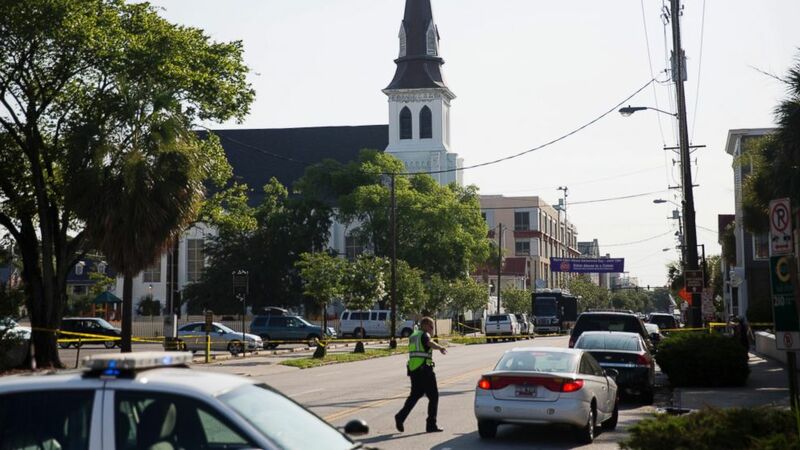 camera (David Goldman/AP Photo) The steeple of Emanuel AME Church rises above the street as a police officer tells a car to move as the area is closed off following a shooting, June 18, 2015 in Charleston, S.C.
A group from Emmanuel African Methodist Episcopal Church's congregation held an "emotional meeting" today in the room where nine parishioners were shot dead, allegedly by a man who joined their Bible study in Charleston earlier this week. "They did a good job cleaning it up," said churchgoer Harold Washington. "There were a few bullet holes around, but ... they cut them out so you don't see the actual holes." It was not clear what the meeting was about. A morning worship service and Sunday school is set to be held Sunday morning, just days after the massacre, a presiding elder at Emmanuel AME told ABC News today. Washington said he expects a packed, emotional service Sunday when the church reopens. (Stephen B. Morton/AP Photo) Charleston police officer T. Graves carries flowers, June 18, 2015 to a make-shift memorial in front of the Emanuel AME Church in Charleston, S.C.
"I think it's gonna be a touching moment -- a lot of crying, hugging," he said. "We're gonna have people come by that we've never seen before and will probably never see again, and that's OK.
"It's a church of the Lord - you don't turn nobody down." 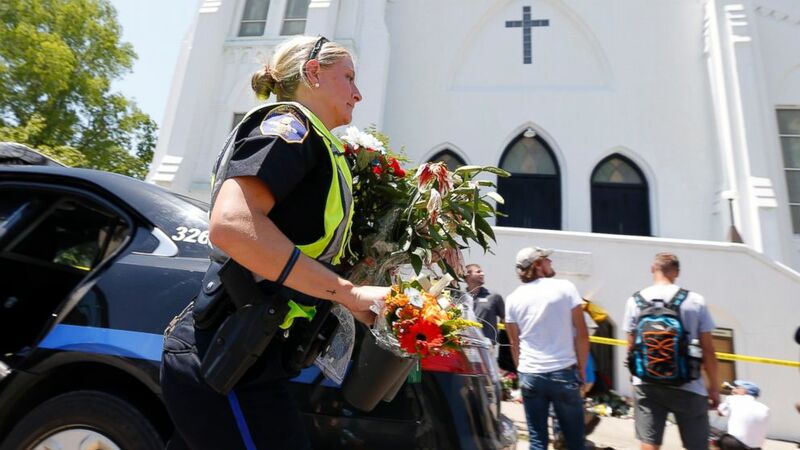 Many pastors of other AME churches in the south will also continue their Sunday services as scheduled, choosing to embrace their longstanding acceptance of strangers despite security concerns following the attack. 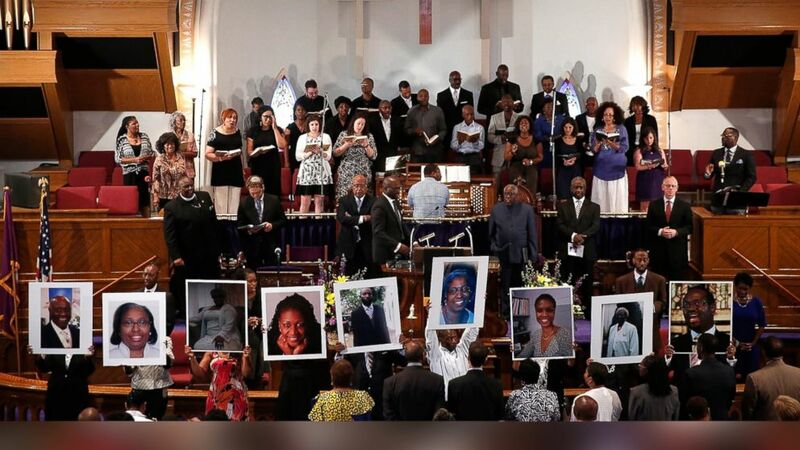 (Win McNamee/Getty Images) Photographs of the nine victims killed at the Emanuel African Methodist Episcopal Churuch in Charleston, S.C. are held up by congregants during a prayer vigil at the the Metropolitan AME Church June 19, 2015 in Washington, DC. Bishop James Levert Davis, who oversees 300 churches in Alabama as the head of the ninth district of the AME church, described the task facing pastors as one of striking a balance. "Even in the midst of these trying and difficult times, we cannot afford not to be the church," he said. "We have an open arms policy, not only an open door. Yes, that’s risky, but it is the calling of the church." The Associated Press and ABC News' Meghan Keneally contributed to this report.